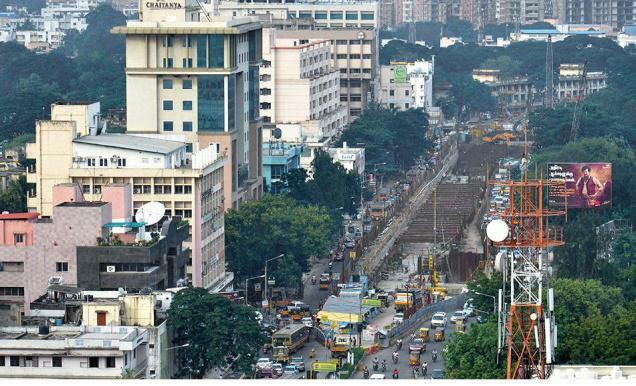 While Chennai Metro Rail trains are zipping through one end of the city, the work on the arterial Anna Salai has come to a standstill for months now. The entire project of Chennai Metro Rail is scheduled to be completed by the end of 2016 but since the tunnelling work on this stretch has been abandoned, it is not clear if both corridors may be able to meet the deadline. Chennai Metro Rail Limited (CMRL) had awarded a joint venture contract for Rs. 1,947 crore to Gammon India and Mosmetrostroy in 2011 for the construction of seven stations including Saidapet, Gemini, Teynampet, Government Estate and LIC. According to CMRL officials, after the Russian contractor Mosmetrostroy deserted the project, the tunnelling work has not been taken up by any other contractor as yet. They abandoned the project owing to a severe financial crunch, officials said. The joint venture partner of Mosmetrostroy, Gammon India has been doing only the station work on this stretch. Last month, a committee was formed to look at options and decide on what may be done to complete the project. “But no decision has been taken as yet as far as Anna Salai is concerned. The tunnelling work for the stretch from Saidapet to AG-DMS has been given to Afcons Infrastructure Limited,” an official of CMRL said. At present, Afcons Infrastructure Limited in a joint venture with Transtonnelstroy has been carrying out the tunnelling and construction of stations from Washermanpet to Chennai Central.